Old Main, The Farmers" High School of Pennsylvania, Centre County, PA, 1859. Following World War II, Penn State had a reputation as a "cow college," devoted to agricultural and technical studies. According to Eric Walker, a postwar dean of engineering and later university president, Penn State's financial situation was the "worst of two worlds." Being a "state-related" rather than "state-created" institution, it received less state support than the Midwestern and Western state schools, despite perceptions of unlimited public funding. And unlike privately endowed schools such as the University of Pennsylvania, Lehigh, and Swarthmore, it could not count on large gifts from rich alumni. In the years to come, however, Penn State would redefine itself as a major research university that attracted substantial federal support, particularly from defense contracts. Intended to minimize veteran unemployment and unrest following the war, the Servicemen's Readjustment Act, popularly known as the G.I. Bill, fed an unanticipated boom in college enrollment. State universities absorbed the bulk of the skyrocketing enrollment, attracting many students to their technical programs. At Penn State, enrollment jumped from under 6,000 in 1938, to more than 10,000 in 1946, 55 percent of who were veterans. To accommodate its enrollments, Penn State sent its freshmen to undergraduate centers across the state or to other Pennsylvania schools, particularly the thirteen state-owned colleges. On the main campus, it housed some of its upperclassmen in surplus trailers and single-story prefabricated buildings. At Penn State and many other state schools, the postwar jump in enrollment also marked the beginning of increasingly large class sizes. Ordinance Research Laboratory, Penn State University, 1946. A growing research budget fueled by defense contracts drove Penn State's transformation to a major research university. During the war, federal funding of defense research enabled Penn State researchers to study ships' hulls, aircraft lubricants, building materials, and drugs, notably penicillin. After the war, its defense contracts increased dramatically. After Harvard terminated its Underwater Sound Laboratory (USL) at war's end, Penn State in 1945 hired Eric Walker, USL's assistant director, to head its electrical engineering department, and the Navy transferred USL's torpedo division to Penn State, where it became the Ordnance Research Laboratory (ORL). In 1949 the ORL opened its Garfield Thomas Water Tunnel, then the largest high-speed water tunnel in the world, to further torpedo research. Funding for the ORL would continue to dwarf other research done at the university, but other projects also came to Penn State. In 1955 when Milton Eisenhower–president Dwight Eisenhower's brother–was the university president, Penn State opened the first campus reactor to reach criticality. In 1962, it opened the Materials Research Laboratory with $690,000 from the Defense Department. In 1989, Penn State became a "Space Grant University," and by 1991 ranked third nationally for Defense Department funding. Private funding also grew so that in 1999 Penn State ranked near the top in research funding received from industry. By 2003, its total research expenditure exceeded $500 million. 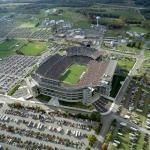 Penn State University's Beaver Stadium, 2001. 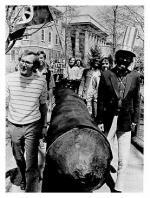 Penn State's postwar transformation was not without controversy. In the 1950s, Cold War red baiting led to charges of un-American activities and the firing of a math professor and a former marine. When Penn State President Eric Walker (1956-1970) spoke of "the challenge of mass excellence" in response to growing unease over the university's growing size, and quipped that students would benefit from facing stress early, one student proposed a "Walker ward" for students who suffered mental breakdowns. In 1960s and early 1970s, students protested housing shortages, curfews, the Vietnam War, military presence on campus, racial imbalance, and in 1972 briefly closed the ORL for its role in the Vietnam War. Rather than halt unpopular military research, the trustees renamed it the Applied Research Laboratory (ARL), still the designated location of classified research on campus. During the postwar years, Penn State shaped the lives of tens of thousands of students, and, through its research and extension programs contributed to Pennsylvania's industries and agriculture. The university also drew growing numbers of visitors to Centre County, particularly during football weekends, where the Penn State Nittany Lions played at the ever-expanding Beaver Stadium, which can seat more than 107,000. The university also attracted new industries to State College, and a growing number of retirees. Despite its successful transition into a research university, Penn State's hybrid state-related status, now shared with Temple, Lincoln, and the University of Pittsburgh, has led to the dubious distinction of being one of the most expensive public schools in the country, challenging its ability to bring affordable higher education to Pennsylvanians. 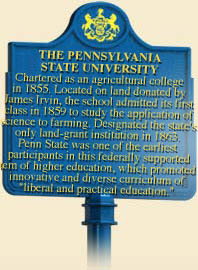 To learn more about the early history of Penn State, click here. Michael Bezilla, Penn State: An Illustrated History (University Park: Penn State Press, Pa.), 1985. Kenneth J. Heineman, Campus Wars: The Peace Movement at America State Universities in the Vietnam Era (New York,: New York University Press), 1993. Keith W. Olson, "The G.I. Bill and Higher Education: Success and Surprise" in American Quarterly, 596-610December 1973.